In many places Bottle Brush trees are just too big. Callistemon Little John provides all of the interest in a small package. The leaves and stature are both reduced in size. The flowers, aside from being a slightly deeper red are the same. 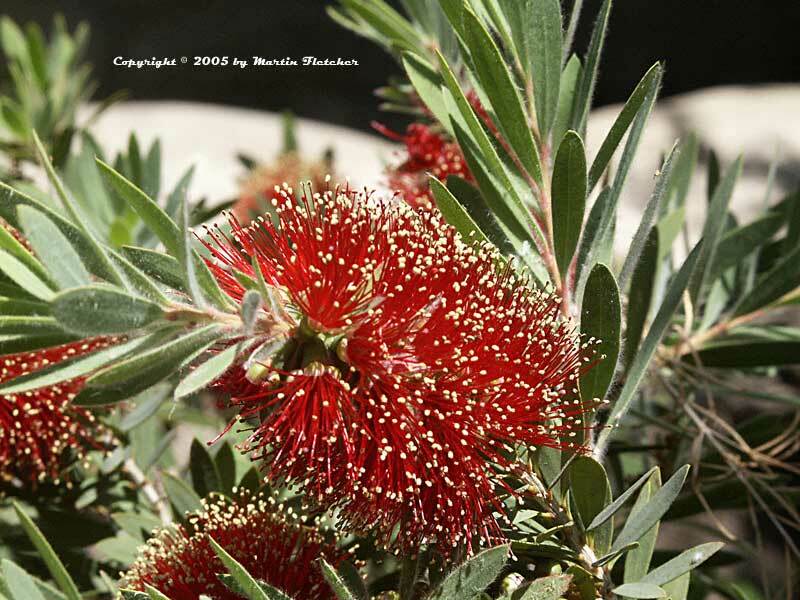 There is another Dwarf Bottlebrush with pink flowers that is larger, Callistemon citrinus jeffersii. Callistemon Little John attracts hummingbirds like almost no other plant. And they require almost no care. A little water keeps them looking much better, though they will often come back from extreme drought shock if you waited a day too long. Callistemon Little John is frost hardy into the low 20°s F. Slightly below that and Callistemon Little John shows a lot of branch tip damage that can take quite a bit of time to clean up. The dead foliage will hang on for months if you don't. Flowers and foliage of Callistemon Little John known as Dwarf Bottlebrush. High resolution photos are part of our garden image collection.